California state senator Leland Yee has been indicted on charges of corruption and bribery, according to multiple news reports. 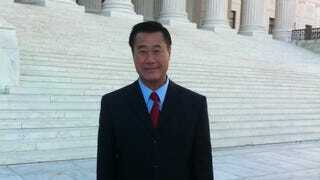 Yee, a Democrat, is the senator who attempted to criminalize the sale of violent video games to children. That law was struck down by the Supreme Court in 2010 during what became a landmark case for free speech and one of the biggest legislative battles the video game industry has faced to date. Yee has been a state senator since 2006.